A romantic drama, Cold War explores a love story stifled by the hardening politics of a Europe emerging from mass destruction. In post-war Poland of 1949, Wiktor Warski (Tomasz Kot) and Lech Kaczmarek (Borys Szyc) are part of a cross-country government initiative to find and promote rural folklore talent as a national pride rebuilding initiative. 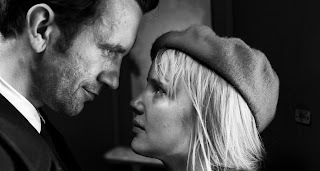 Zula (Joanna Kulig) auditions as a singer, and Wiktor spots her talent and star potential despite a chequered history which includes a stabbing and prison time. They start a passionate relationship. With Wiktor as director and Zula as star performer, a folklore troupe is formed and starts touring. The manipulative Lech is interested in twisting art to serve the Soviet communist agenda, prompting Wiktor and Zula to start thinking about defecting to the west. An opportunity arises when the touring company arrives in Berlin, but not everything goes according to plan. Years of struggle ensue as the lovers wrestle with political and personal barriers to physically and emotionally reconnect. Filmed in gorgeous black and white and clocking in at a deft 85 minutes, Cold War is a visual feast, with evocative music to match. Directed and co-written by Paweł Pawlikowski and loosely inspired by the story of his parents, the film does not waste a single frame, and yet creates a rich texture of deep emotions across 15 years and multiple countries. Carrying unmistakeable echoes of a stripped down The Unbearable Lightness Of Being, Cold War does shortchange the initial stages of romance. The love ignites quickly and intensely, the courtship and dreamy romance almost entirely skipped in favour of immediate animal magnetism. Most of the film then places a series of difficult hurdles for the lovers to overcome, and the strain of dealing with separation, snatched encounters and foreign countries often drives them apart. With an insufficient reservoir of unifying foundational couplehood to draw upon, the narrative tilts towards unbalanced resentment. If the relationship is more about acrimony than amour, Pawlikowski compensates with a radiant recreation of mid-20th century Europe. From the Polish countryside and concert halls to smoky Parisian clubs and cramped apartments, Cold War is brimming with exquisite compositions. And the music, a mix of poignant folklore and dictator aggrandizing communist propaganda, provides a soulful backdrop to troubled love. Joanna Kulig provides the radiant heart of the film, casting Zula as a subversive yet magnetic city spirit happy to play along with the rural impersonation to escape the past and carve a new future. Cold War combines a fierce romance with a darkening political landscape, Wiktor's journey from state agent to outcast tracing the descent of a country into the abyss of communism where art and music exist to glorify dictatorship. Wiktor and Zula know they don't belong within these borders, but finding a way out together will not be easy.